Whether you are a high school competitor looking to improve your running speed or you are a Division I elite athlete that is wanting to stand out to professional scouts, you need the proper drills and techniques to help you elevate your level of competition. While there are many speed and quickness drills to help you run faster, many of these drills do not produce measurable results. This is just one of the reasons why we have designed one of the most effective speed training programs so that you can run faster, jump higher, and outcompete anyone that stands in your way. What is the most effective way to increase speed of your muscle contraction? 1. Increase the Strength in Your Legs, Thighs, Hips, and Ankles One of the consequences of heavy exercise is the addition of extra body weight in the form of muscle, fat or both. Added weight in areas that are not relative to the skill simply becomes excess baggage. More often than not, it won’t improve your speed if you increase your lower muscle strength and, in the process, gain 10 pounds. This added weight is carried with you wherever you go, and if you think you are going to be able to run faster or even jump higher with what amounts to a 10- or 15-pound vest strapped around your chest, you are mistaken. Drive Phase of Sprinting and Running: Muscles Involved. If you want to improve your running speed it will be helpful to know the 3 phases of the running process and the muscles used in each phase. By understanding this you can train all the muscles used when running for faster running speed. This post will focus on the drive or push phase of running and identify the muscles used in the push phase. 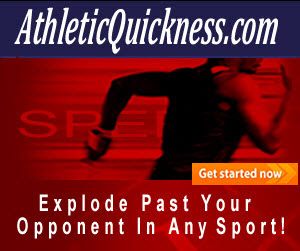 Speed training exercises that focus on these muscles can be found in the links below. Figure 1. Drive phase starts when the knee is perpendicular to the ground. The drive phase ends when the entire leg is extended behind you. See image below. Increase your Running Stride Length and Turnover Rate One of the best ways to increase your running stride length and turnover rate is to develop strong hip flexor muscles. These are powerful and long muscles located in the front side of each of your hips. Your hip flexors are some of the longest and strongest muscles in your body, but they are essentially dormant in most athletes, meaning, they have never been activated for speed or exercised properly for any athletic function other than walking. Some of them, begin high up in your lumbar spine while others start out low on the pelvis; and, they all cross the hip joint. Most of them attach to your thigh while one of them, the Sartorius, is so long that it attaches just below the knee. We get lots of questions on how to use resistance bands for speed, especially when it comes to helping people run faster in any sport and as part of their speed training program for soccer, football, track and most any other sport where speed matters. Questions like how, or, where to attach the speed bands so they won’t easily break when while using them. We recommend attaching them to an immovable object (relative to your own strength) such as a steel pole as well as one that doesn’t have any sharp edges that may tear your band.